We used to love ice cream but you'll find your pallet changes when you are eating good healthy fats and very little (if any) processed sugar. So we knew we needed to try our version of the delicious ice cream alternatives we keep seeing. 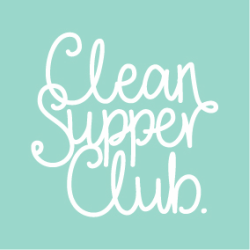 So here's a rather lovely Clean Supper Club recipe that everyone will enjoy, a healthy alternative to ice cream. NIGHT BEFORE SUNDAE CREATION: Put 6 bananas in freezer and 1 1/2 cups of cashews in a measuring jug full of cold water to soak overnight or for at least 2/3 hours. 1. To make the Strawberry Nice Cream put 2 chopped frozen bananas, 1/2 cup of soaked cashews, the fresh strawberries, coconut cream, vanilla, lucuma & strawberry powders (see right for amounts) into a high powered blender and blitz until you get a deliciously creamy smooth texture. 2. Place mixture into Tupperware and freeze for 30 minutes, then take out and stir (this is to stop any ice crystals from forming) then pop back into the freezer for up to 1 hour or until firm and scoop-able. 3. Before creating the next ice cream flavour, wash out your blender using warm soapy water, rinse thoroughly. 4. To make the Avocado & Mint Nice Cream, finely chop the mint with a knife and put it into your high powered blender along with 2 chopped frozen bananas, 1/2 cup of soaked cashews, half an avocado, the coconut cream & supergreens powder. 5. As before, place this delicious mixture into its own tupperware and freeze for around 30 minutes before taking it out to stir, then pop back into the freezer for up to 1 hour or until firm and scoop-able. 7. To make the Coconut Cream Nice Ice Cream flavour, after weighing out the cacao butter, grate it into the blender using a cheese grater (this makes it much easier to mix)! Chop up the last 2 frozen bananas, add them to blender along with the last 1/2 cup of cashews, coconut cream, vanilla & lucuma powder and blend on high power! 8. Place in tupperware and set in freezer, take out and stir after 30 minutes then pop it back into freeze for at least 1 hour or until scoop-able. Once all three flavours of nice creams are set. Scoop 1 of each flavour into bowl or ice cream glass, sprinkle with cacao nibs, coconut chips and mulberries.